« 22 - What is safe? 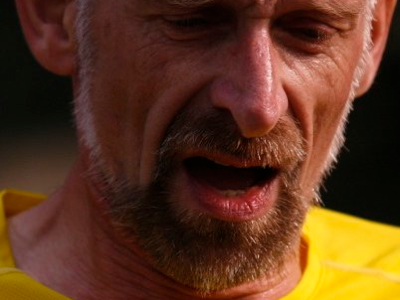 A long time ago I wrote a piece about the factors affecting running. This sat on the wall outside Room 4 at PMC for several years. I had thought to rewrite it, but first I must find it all over again. The wonderful tools available to an Apple user show that it is not on the two machines I have with me, so I may end up rewriting from scratch. There are many factors affecting performance in running. I am referring to regular training and what I have to say may well apply to any training of a repetitive nature where the edges of the physical envelope are explored. Regular running of twenty minutes or longer—my own preference is for a half-hour—causes one to develop preferred routes and out of that habit comes competitive comparison with previous occurrences. You race the watch, not watch the race. In doing that racing against the watch, one becomes aware that all days are not the same. There are factors that improve matters; these are largely incremental and it takes a while to demonstrate any improvement. There are those that make things worse, many of which are catastrophic (injury, icy surfaces, crowds) and many with small but definite effects, such as the wrong clothes, or being slightly ill. There is another group of factors that go one way and then the other. These would include taking a day off. Runners are more affected by wind (no, external wind) than they think and experience shows that while the downwind legs of a run are faster than with no wind, the upwind ones are slower by more, so the overall effect is to slow down. Rain has little effect until it changes the running surface, and a light rain or mist often produces better times than a dry sunny day. In Britain. This, I think, is because the breathing is easier (the air is wet). This benefit can be cancelled by the accompanying temperature. It is different when running in China, where the wet may react with the pollution, depending where you are, so running in the wet may well be cooler, but you can feel you are being poisoned. Temperature has a big effect. High temperature produces problems with the body trying to lose heat and a run becomes a fine balance between sweating to lose heat and the problems caused by generation of more heat and sweat. I find that all temperatures above 25ºC cause slowing, and over 30º even more so. Putting that in reverse, a Chinese summer has many days over 30º and a cooler day means an instant gain in speed. That does not mean a cool day’s run will be faster than the day before, just that it will be faster than the same run would be if the weather was the only difference. The cold tends to be less of a problem until gloves are needed; the extremities do tend to suffer first and it is not uncommon to see runners with hat & gloves but still running in shorts and tee-shirt. At any temperature where you need a tracksuit, you can add several seconds a minute just for the extra clothes. I reckon something like two seconds per minute per extra item of clothes. Humidity has little effect in Britain, but where the temperatures are high and the humidity goes over 30% (pick any number 10% or more higher than what you are used to) one has the effect of suffering from greater heat. In short runs this is of little consequence, but runs of ten miles present real problems of fluid loss. My own experience is that sunstroke is avoided by sweating. Also, you can persuade the body to be accustomed to high humidity. In Nanjing I find I am losing 2 kg of body mass in a 30 min run when the humidity is high (over 70%). In Britain I might not notice any weight loss. See essay 63 on Hydration. I have maintained for years that the body needs to recover from every run, more so with increasing age [more recovery with age, not more insistence; I ran far more often at 57 than I did at 27]. What is not clear is how long the optimum time to the next run is. Running every day for, say, a month, will produce a variation in times of a surprising range. Indeed, my own evidence is that running every day for a long period raises the variability of run times far more than running significantly less often. Let us consider daily running for a month following a long period of lay-off, such as from injury. It is quite likely that running every day will cause a new injury before the month is up. However, assuming you can guard against that by being sufficiently careful, such a sustained daily routine will show a slow improvement in times, particularly dramatic in the first few days; then other factors come into play that mask the continued benefit. Most dramatic in such a renewed training period is to take a day off: the next day’s run is likely to be one with an improvement. Running less often may be under-training. Running every second day is a routine I practised for several years and found very successful once a (high) level of fitness had been established. Fitting running around other sports and keeping the running at 3 or 4 times a week proved remarkably successful in my early 50s, where for one year I averaged only 20 miles a week and was in the top five of my age group in every race that year. Thus it may be that there is a balance between the body recovering and gaining benefit from the next bout of training. As one ages, so the ability of the body to repair slows down. This then becomes the limiting factor in punishing the body with vigorous exercise. Mixing impact with gym work is probably beneficial. However, balance that against the later fifties, where I run every day (say 28/30) with no ill-effects in a year. That may be because of higher temperatures reducing the risk of injury. Running style² has a huge effect on damage. Basically, if you can hear your feet slapping the road, that’s not a good thing. Smooth running must be better running. I have never been bothered about style per se, but I recognise that if your head is not bouncing up and down, you’re probably doing quite well. If you can find someone to teach you style, you’re lucky and you should take advantage of any such offer. Injuries, particularly the small pains that are skeletal and take days to reveal themselves, are especially good at telling you about errors in your running. Generally it would seem that the joint above the place with bad posture or style is the one that suffers. If your hips hurt, it’s something to do with your thighs. If your knee hurts it’s any of a myriad things, but you might look at footwear and foot placement before you go off to moan at a medic. If it’s your back, the chances are you’re doing something odd at the hips, running too upright, bent over, twisted or somesuch. A video would help track down what is going on. By the time you need a medic you have largely missed the chance for self-help. Does training cause pain? “No pain, no gain” is an oft-quoted mantra. To a large extent it is true, but that is because our soft lifestyles lead us to avoid even small discomfort. If you’re planning on a half-marathon and you can’t talk to the runner next to you, you’re going too fast (elite runners excepted). If you are not panting when running in the autumn in Britain, you’re not trying. If you’re racing and you feel comfortable then it’s your lucky day – or you really are not trying at all. Heart rate: a useful guide, this. Know your resting pulse (before or after sleep, looking for the (s)lowest figure). Take a long enough sample for slow heart rates. Sixty is good, forty is brilliant (and shows a lot of past work). You will find guides in any good gym about training zones, but taking your age off (away from) 230 is a decent rule for your pulse ceiling. The very fit can push this on race days. At 45 I was still hitting 190 every day, but that may yet prove to have been a mistake. At 54 I dislike going over 180, and at 56 I dislike going over 175. Think of the heart as a gadget with a life-span; it is a pump and it works without pause all its useful life. You look after it and it will perform. Exercise of the aerobic sort tends to make the heart bigger, so it moves more blood, so for two bodies of the same size, the bigger heart has to beat less often to move the same volume of blood. So if it can move more blood, it can move more oxygen to the muscles, so offering greater return. Bigger heart, faster runner. Ditto lungs, the air supply. However, the upper limit on the beats per minute seems to be independent of size, so your strategy has to be to make your pump the biggest one possible so as to allow the biggest margin near the limit. Going running (not jogging, but running) is a fine balance between where the heart-lung system complains, where the muscles complain and where the whole body as a complete unit can’t cope. In a long race this last can become the limiting factor. The muscles will work until you ask them to do things not practised – that’s what training is for. The heart & lungs give you the aerobic fuel. The rest of the body is coping with losing heat and spending energy. Changing any of these takes a long time; there are no quick fixes and the biggest problem is often an excess of enthusiasm where a habit and a routine, while potentially boring, are more likely to produce the desired result. Recent research in 2010 shows that, for the older sportsman, one is ‘fit’ for one’s sport, but probably not so for other activities. I found a report of measuring the ‘fitness’ of three older sportsmen, one of whom cycled an hour or so per day; the testing was based on a running machine and he was measured as substandard compared to his colleagues until he persuaded the test to be moved to a cycling machine. This suggests that one’s body becomes accustomed to a particular exercise and thus I conclude that cross-training becomes more crucial with age. It is one thing to pursue a sport with single-mindedness but quite another to be prone to all sorts of injuries because of the specificity of the training - there’s not a lot of point staying a world-class cyclist (swimmer, runner, oarsman) if you risk injury by moving the full washing basket, changing a tyre or chasing the missus around the room. The other point gleaned from that research session was that there is agreement with my rule of thumb of 1% decay per year from peak. In my case, peak at 35. The consensus says anywhere between 0.6% and 1.5% annual decay. Beating that becomes your measure of improvement. Thus you can imagine how I feel about a PB for the half marathon at 55; my first thoughts were that the course must be short and I am still uncertain. Only when other results show the same sort of general improvement will I believe that time. Personally, I find variety is what makes training fun. Going somewhere new is a great chance to explore. Going on a familiar run is a chance to push the training and to measure the progress, to anticipate a race – always a good incentive for training. At the same time the very repetition brings on boredom unless you’re excited by the numbers. Variety is also found in doing other sports (or activities). Impact sports and field sports risk injury (but so does crossing the road carelessly) and runners tend to collect injuries by virtue of excess speed and minimal experience of the ‘new’ activity. That doesn’t stop these other sports from being fun, nor should it prevent you from doing them. Long-distance walking and hill-walking are great for runners; while you would think that the half-hour run would have little effect, it is runners who do long-distance walks, who are seen (misread) as hill-fit, who are invited back to walk again. Conversely, if you fancy yourself as a walker, running is the most time-efficient training for it. Easily. I found rowing a good counter-activity, squash was always showing acceleration to be poor but stamina to be good; soccer and hockey were always great fun. The point is to set yourself a target that gives an equivalent to any other training session. It is much too easy to stop, in the gym. Outdoors on a route, you want to get home eventually – so once you’ve reached halfway round your route, it is often difficult to cut it any shorter. Where shortcuts are possible, I have grown the habit of setting targets of poor performance (“I take the short route if I can’t reach that corner within 15 minutes”, where a good day puts that same corner at 13) on the grounds that a bad day may well mean I’m failing from issues worth attending to (illness, injury, non-physical problems). If I’m sure that the failing is mental, I try hard to ignore the clock and might set the test round the other way - if I only reach this 13-minute corner in 15, I add that extra ten minutes. The only problem with that approach, though, is that when you are being mentally weak, you aren’t going to persuade yourself to do any extra. You know you got the training wrong when the next race leaves you well behind what you know you should be able to do. Conversely, of course, for some people, only a bad race is enough to make them take training more seriously. Daley Thompson pointed out that if you didn’t enjoy the training, you wouldn’t do the sport at all, because there are many more training days than competitions and you wouldn’t put up with such a poor return on the time spent. Oh boy, is he right about that. 1 Conversely, you can argue (well) that any repeated exercise has its faults and that variety is better for the body. Essays, please, with data. I have mine used for the opinions expressed here. 2 Simon Ekin directed me to read Christopher McDougall’s book, Born to Run, (just his name is enough for you to find it, actually). I have read it, 20121001-3 and agree with much of what he writes, as he does with what I have written, though your reading may point up places where you think he and I disagree grossly. Do write and point them out. Simon himself (from my very first Maths class) invited me to run in a ‘local’ race, in 2006. I said yes before I wondered where local meant, and found I’d agreed to go to Cape Town. I was surprised to discover that Simon considered himself ‘too old’ to go running (ooh, 40 is so old). I made the top 4% again, but only just. Suggestion: this research needs repeating. Anyone chasing a dissertation topic out there? Want some help with the stats? Why do you go to the gym? Why do you take exercise? Do you want the body of a sprinter or a marathon runner? Are you looking for a six-pack? These are choices (though you could do them all). Basically you’ll lose flab if you get the body tired. Frightened even. Objective, in short, is to persuade the body into using up its stores of fat by ‘scaring’ it by getting it tired. One way to do this is non-aerobic (weights will do) but slowly, looking for the point where ‘one more rep’ simply isn’t possible. It takes amazingly little time to do this. A six-pack does not require 400 sit-ups a day. You might do 20 slow crunches and get results far faster. As with so many things, it is a mental problem at least as much as a physical one. Diet needs work too, but there is argument that says if you’re doing enough work (meaning: a lot), it doesn’t matter what you eat, the body will sort it out. The pics? In yellow, at the finish of the Nanjing Triathlon, our team winning. 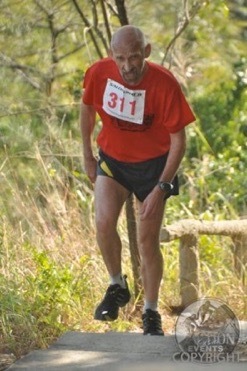 In red, near the end of a race in Hong Kong (see 66 A Trail Run). These are winner’s photos, not to show off, though I agree that is what is happening, but because a winner has cameras waved around; a non-winner needs a friend around or else cameras are instead waived.